Search giant Google‘s CEO came to San Diego Monday to announce a new search tool to help veterans transition to civilian careers. Veterans can now search for “jobs for veterans” and will then be prompted to enter their three-digit military occupational specialty code to see relevant civilian jobs that require similar skills. Employers can also incorporate the search functionality. 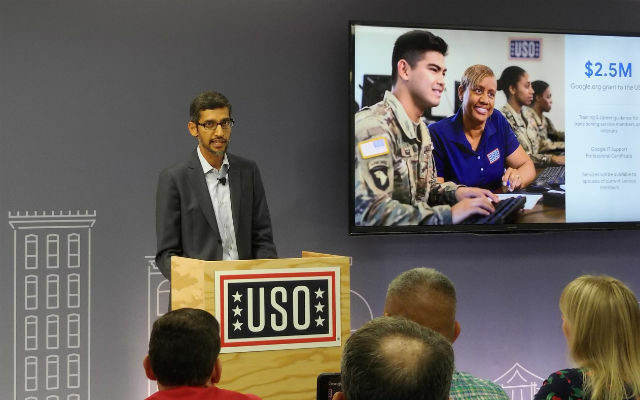 Pichai was joined at the USO‘s new local headquarters in Liberty Station by the USO’s national CEO and President, J.D. Crouch II. In addition to the search improvements, Google is adding a special designation to search results and maps for veteran-owned businesses. “Knowing a veteran leads a business leads to trust,” explained Pichai. Couch noted that 200,000 Americans transition out of the military every year and face the challenge of re-integrating into civilian life. “Getting a job is part of that — a central part,” he said. The USO offers help with the transition through its Pathfinder program, and Google also announced that its nonprofit arm, Google.org, will donate $2.5 million to incorporate the Google IT Support Professional Certificate in the USO’s career training. The effort is part of Grow with Google, the Silicon Valley tech company’s initiative to help create economic opportunities for Americans.